And here is the bleak new world of the day after: a world stripped of its institutions and emptied of 99 percent of its people. A world in which a handful of panicky survivors choose sides--or are chosen. A world in which good rides on the frail shoulders of the 108-year-old Mother Abagail--and the worst nightmares of evil are embodied in a man with a lethal smile and unspeakable powers: Randall Flagg, the dark man. 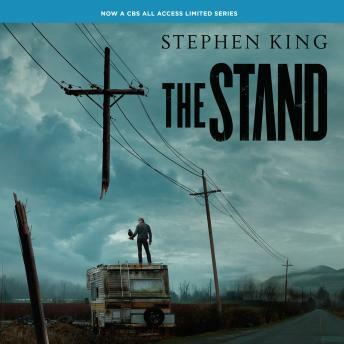 Stephen King, once again writing characters in such a way that they come alive. You really care about what happens to them. Read by one of the best voices to read audio books, Grover Gardner. The book itself was amazing, it kept me at the edge of my seat on every chapter. The narrator did an exceptional job with every character, without overdoing it like with other audiobook narrators I've encountered. Highly recommended. Great “read” and the narrator was perfect! This book was amazing! The narrator did a wonderful job at making the characters come alive. Rich with adventure and suspense. You find yourself getting attached to each character with the way King introduces them. Narrator does a wonderful job slightly changing his voice for the characters but not so much it distracts you from the overall story. Wonderful listen all around. What more can I say. Masterpiece. Narration hands down one of the best I've heard. If you become one with a book, it will freak you out the way a psychologically scary movie will. awesome work, Mr. King. I suppose I am just not a fan of Stephen King's style of writing. I couldn't even finish this. It just droned on.